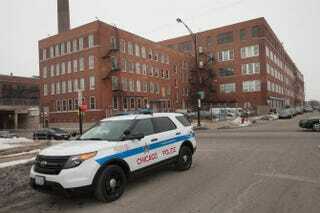 Chicago police vehicles are shown parked outside a police facility on the city’s West Side Feb. 25, 2015. A 61-year-old Chicago woman who was sitting on the couch watching the news suffered a gunshot wound to her neck after at least four bullets pierced her window, the Chicago Tribune reports. Jonathan Enriquez, 19, was reportedly upstairs in the family’s two-story red-brick home, playing video games, Tuesday night when he heard gunfire. Going downstairs, he found his grandmother lying on the couch, holding her neck. “She was just lying there, breathing really heavy,” the teen said. “I held her head, trying to keep her awake. “I had to be calm. I had to,” he added. The woman, identified as Miriam Enriquez, was taken to the hospital, where she was in stable condition, the report notes. Authorities and family members say that someone in a white sedan fired at the house at about 10:20 p.m. Officers responding to the call started chasing a vehicle that was fleeing the scene. The car, heading south on Interstate 555, ultimately crashed on the ramp to Interstate 294, where police caught up with the suspect. The authorities said they were still questioning a suspect involved in the crash, according to the Tribune. According to the report, before the shooting, Miriam Enriquez’s son was involved in a confrontation with another individual outside the family home, and it is believed that this individual later came back and opened fire at the residence.